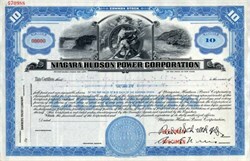 Beautiful specimen certificate from the Niagara Hudson Power Corporation. This historic document was printed by the American Banknote Company and has an ornate border around it with a vignette of an allegorical figure. This item has the printed signatures of the Company's President, and Secretary. 1929: Fifty-nine companies are brought together as the Niagara Hudson Power Corp.
1937: Company is restructured, renamed Central New York Power Corporation. 1950:Company is again reorganized, becomes Niagara Mohawk Power Co.
1965:Niagara Mohawk builds first nuclear plant. 1988:Second nuclear plant comes on line after long construction process. 1998:Deal to buy out costly independent power producer contracts is finalized. 2000:Company is acquired by U.K.'s National Grid PLC. The company did not assume its present configuration nor take its present name until 1950. As early as the late 1870s, however, the great natural resource of Niagara Falls had been tapped to provide energy in the form of water that turned a wheel, which in turn generated electricity that operated several mills. In addition, water power from the Niagara River was used to operate a primitive electric light machine, and thus the hydroelectric era at Niagara was inaugurated in the years before 1880. By the early 1890s advances in the design of power plants resulted in the Niagara producing more energy than could be used in the immediate surroundings. In the wake of this success, other hydroelectric stations, which would one day become part of the Niagara Mohawk network, were set up in the late 1890s and early years of the 20th century to exploit the power of the many rivers of upstate New York. Within a few years, the problem of how to transmit power from its source to the places where it was needed had been solved with the use of transformers and high wires carrying alternating current. In 1896 the streets of the nearby city of Buffalo, New York, were lighted for the first time by energy from Niagara Falls. Slowly, power lines were extended from water-powered generating plants into other urban areas. By 1917 steam-generated electricity had come to play a significant role in providing power to upstate New York. By the end of the 1920s, three separate holding companies encompassing 59 different firms served the energy needs of northern New York state. One holding company used the waters of the Hudson River to generate electricity for the area around Albany, New York; another was centered primarily on the Mohawk River and its tributaries; and a third drew from the resources of Niagara Falls and a large steam-generating plant near Buffalo, New York. Each company within these groupings provided for the needs of its area with its own generating plant and bought and sold excess power as it was needed or became available. 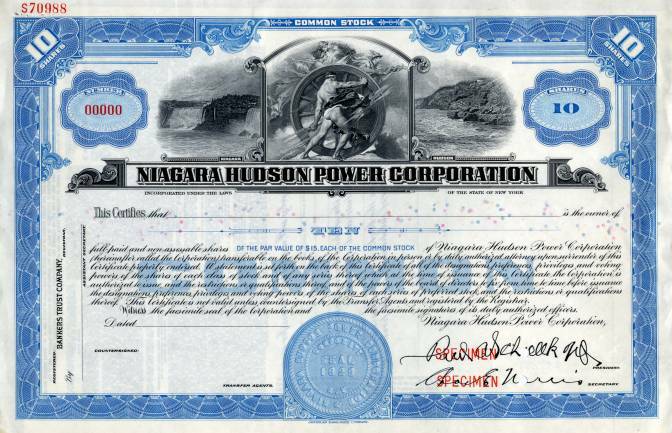 In 1929 all 59 companies were brought together under the aegis of the Niagara Hudson Power Corporation, which had been formed specifically for this purpose. Although this united the companies under one owner, their corporate structure and operations remained much the same as before. In 1932 Niagara Hudson completed a large Art Deco-style headquarters building in Syracuse, New York, whose architecture incorporated many different kinds of decorative illumination, illustrating the wonders of electric power. In this same year, Niagara Hudson also first mixed natural gas into the manufactured gas that it supplied to its customers for use in furnaces, water heaters, and household appliances such as stoves and ovens. Although lighting powered by gas manufactured from coal or oil had been seen as a competitor for electric illumination in the late 19th century, it soon gave way before the superior qualities of Thomas Edison's incandescent light bulb, and purveyors of gas were forced to fall back on the market for household conveniences. In order to finance the construction of larger generating plants and pipelines to residential areas, gas companies allied themselves with electric companies, and pipelines were subsequently constructed under power-line rights-of-way by these new, dual-purpose companies. In 1937 in the midst of the Great Depression, Niagara Hudson's twofold electric and gas businesses were reorganized. The 59 separate companies within its structure were reduced to 20, and these companies were separated into three wholly owned principal operating subsidiaries corresponding to their old geographical groupings. These three subsidiaries were Central New York Power Corporation, New York Power and Light Corporation, and Buffalo Niagara Electric Corporation. The entire company was incorporated under the name of Central New York Power Corporation. With the arrival of the 1940s and the entry of the United States into World War II, the country converted to a wartime economy, and as a symbol of the new austerity the elaborate external decorative lighting of the Niagara Hudson headquarters building was removed. By the end of the 1940s, it had become clear that the geographic administrative divisions that remained within the company were not appropriate for the production of electricity and distribution of natural gas, and a final level of consolidation was undertaken. In 1950 the three operating divisions and the 20 companies within them were combined to form a single operating company, Niagara Mohawk Power Company.